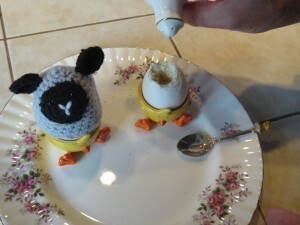 My English husband’s favorite breakfast consists of two soft-boiled eggs with slices of buttered toast on a warm plate. Adding crispy slices of bacon or sausages round out this savory British breakfast. 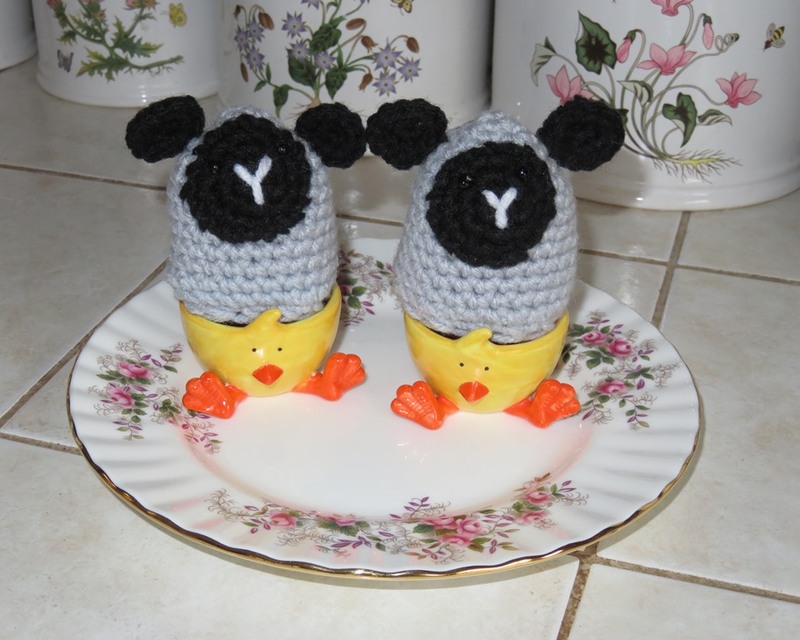 Egg cups and egg cozies to keep the cooked eggs warm come in a variety of themes and sizes to suit every décor and taste. 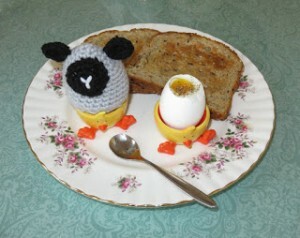 We happen to own a pair of chicken egg cups given to us as a gift and a set of hand-knitted lamb egg cozies. Follow the instructions below to whip up this simple morning fare. 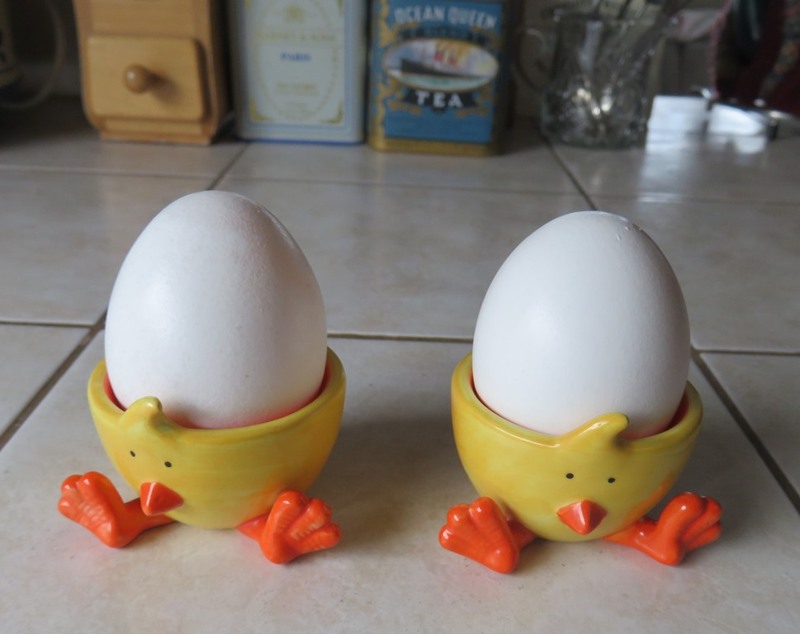 Select your favorite pair of egg cups, making sure the eggs fit in them. 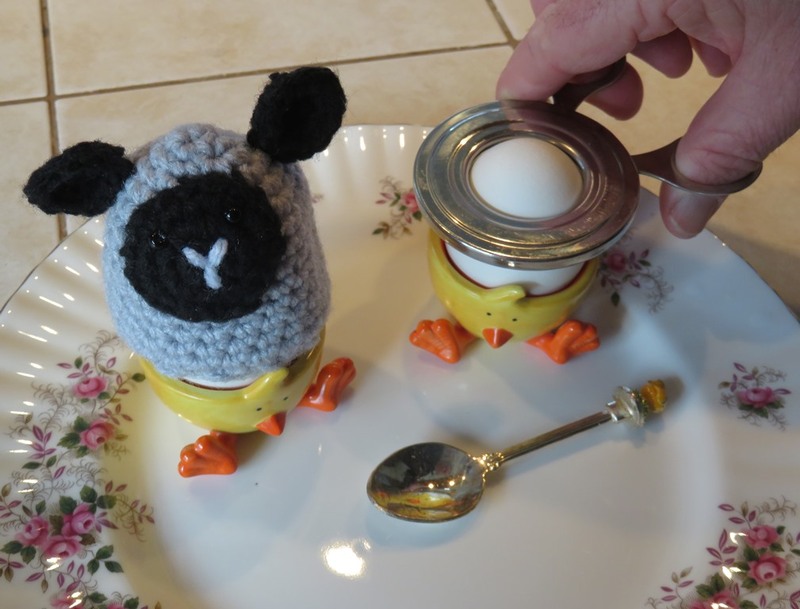 Pierce a tiny hole in each egg on its flat end. 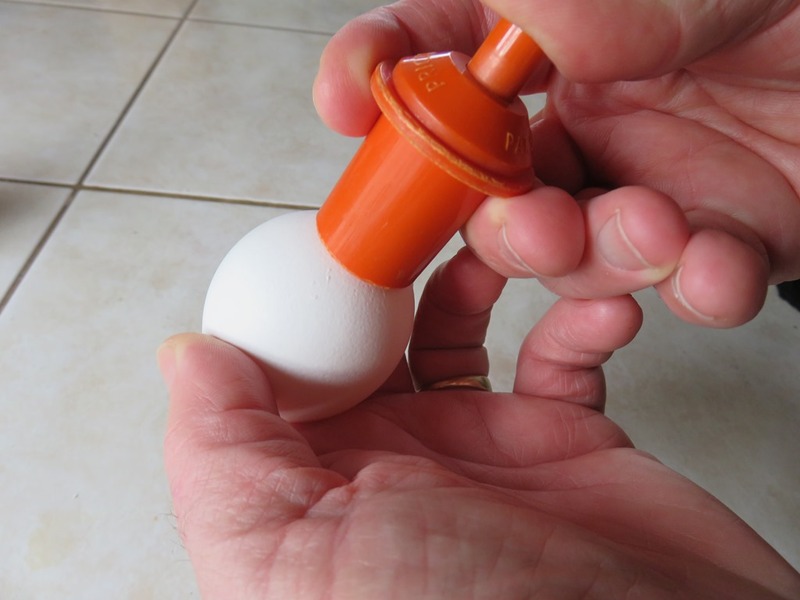 This prevents the egg from cracking while cooking. Gently place the eggs into a pot of boiling water and cook them for five minutes. This is a good time to make the toast and finish crisping the bacon or browning the sausage. 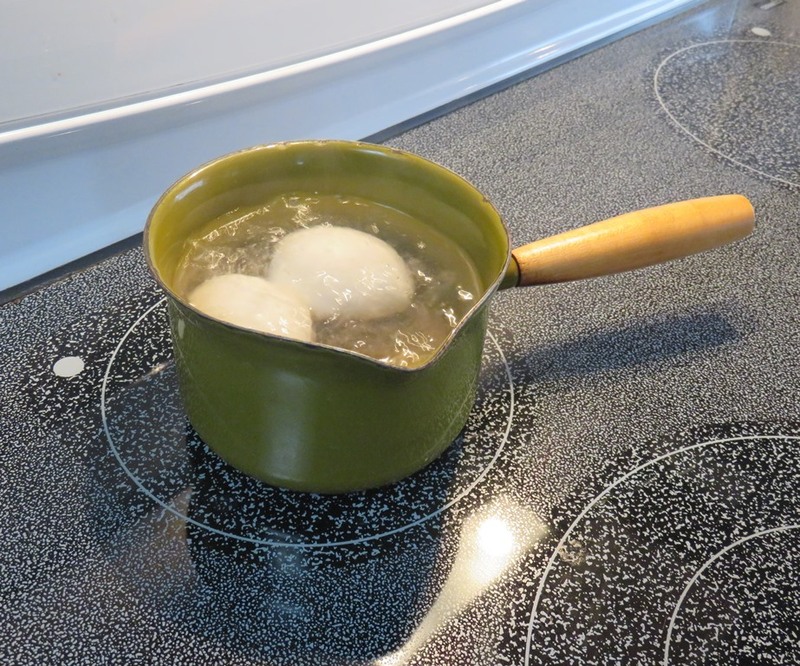 Using tongs, place the soft-boiled eggs in the holders on a plate. Cover with your favorite egg cozies until it’s time to lop the top off the first egg’s shell with egg scissors. Season the soft-boiled eggs with salt and pepper to taste. Serve the soft-boiled eggs with toast, bacon or sausage, and fresh tomatoes alongside a cup of hot, steaming tea. Enjoy! Have you eaten soft-boiled eggs for breakfast? What accompanied them? Do you own a set of egg cups or egg cozies? If so, what do yours look like? *This article first appeared at Stitches Thru Time Writers. Deb Garland is an author, sailor & pastor’s wife. She writes Christian historical romance novels steeped in Scripture & anchored in true stories of the Pacific Northwest, Canada, & Alaska. Winner of ACFW’s First Impressions contest twice for historical romance, she lives on an island in Washington State with her husband of 35 years. This entry was posted in English recipes, English Soft-boiled Eggs - An Easy Recipe, Stitches Thru Time Writers and tagged breakfast recipe, Deb Garland, Deb Garland's Scripture & Story, English recipes, English Soft-boiled Eggs - An Easy Recipe, http://www.blog.debgarland.com, http://www.debgarland.com, Stitches Thru Time Writers. Bookmark the permalink.